A broken clay flower pot can be resurrected for a new life as a landscaped miniature garden scene. Follow the easy steps in this slideshow to see how a standard clay pot, broken in winter frosts, has been reworked to hold a two-level miniature garden connected by a set of stairs. The garden uses plants commonly found in alpine or rock gardens, which have the slow growth that suits small plant combinations for miniature landscapes. These gardens can be used indoors or out, depending on the plants you choose. Take a look at the steps which follow, choose a set of plants to suit your needs, and build your own terraced miniature garden. The gardens work well on their own, or as a photo backdrop for your miniatures. Most of us have broken plant pots, but some are better candidates for re-purposing as miniature gardens than others. The best examples will have 'clean' cracks running across or down the sides. You need the section of a broken plant pot which doesn't have secondary cracks, as you want the pot to survive with its new planting. Hopefully, the pot will still have an upper rim and a full base (with drain hole) to support the weight of a new planting. An intact rim will help protect the pot from further moisture damage. The broken pot will need to hold enough depth of soil in the base without danger of the soil washing out when the plant is watered. If the bottom soil is too thin to support plant growth easily, the garden will need constant attention. Pots with glaze are usually not as sturdy as unglazed pots, even when they are broken. Try to find a pot fired at a fairly high temperature (pots fired in Italy, for example, are generally harder than pots fired in Mexico or Asia. Softer fired pots may continue to degrade, making them very short term prospects for miniature gardens, which can grow for years in a well-chosen container. Keep larger broken pieces of the pot to use as dividers to hold soil and create more interest in your miniature landscape design. Have a few possible plants chosen for your miniature garden, but don't be too fixated on using them all in this one project. Plans can evolve as planting begins! Once you have chosen a suitable broken flower pot for your miniature garden setting, clean the pieces thoroughly with a brush and some biodegradable soap. You want to make sure your pot isn't carrying diseases that can spread into your new design. As you wash the pot, break off any loose sections, better they go now than when they are the main support for plants. If you want your pot to look aged, you can always apply yogurt to the outer surface to attract lichens and moss growth. 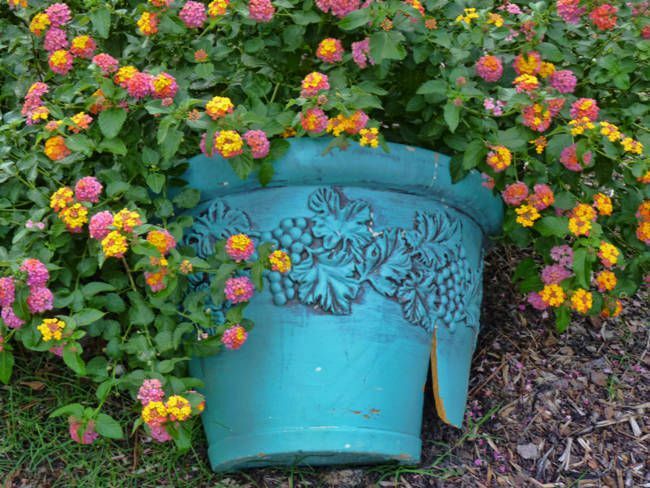 Most broken plant pots can be used for one or two levels of a miniature garden. The trick with planting the garden in layers is to use dividers to hold the upper soil in place. When you look at your broken pot sections, look for pieces which would work to divide the top planted section from the bottom, or pieces which would make a 'handrail' for a set of steps. Experiment with the pieces, trying to keep pieces with intact rims for the division of the planted sections. Think of your miniature garden as having three levels, a base, a middle (to the top of the old plant rim) and a planting area above the rim of the broken pot. Also, try to think of there being thirds across the width of your broken plant pot. This will make it easier to plan interest into your tiny garden landscape. Most terracotta plant pot shards can be shaped using a hammer. Cover the plant shards with a piece of newspaper and wear protective eyewear to make sure flying bits of pot don't hit your eyes! When you have worked out how you will divide your pot and your planting scheme to suit the plants you want to use, gently work the hammer over the edges of the pot or the pot shards to get the best fit possible for your planting scheme. In the photo on this section, you can see how a hammer is used to gently nibble away small sections of a terracotta plant pot shard, shaping it to use as a divider for a miniature garden. The pot edge should be covered with newspaper when you strike it with the hammer to avoid the danger of flying pot shards, which can be very sharp. We've set up this photo so you can see the edge of the plant pot and the size of the pieces being hammered off. Small sections at a time control where the edge breaks. If you hammer too far away from the edge your pot may break into sections you cannot use for your miniature garden. Once you have the shards roughly to shape, you can use sometimes use a rasp or rough file to further smooth the edges and make them safer to handle. When you have your main shards shaped to work as your planned dividers, do a final test fit to make sure they can be held in place by soil and will hold enough soil to support the plants you plan to plant behind them. For this garden, We used two pieces of pot rim set into the soil in the planter to act as a high 'garden wall' and a 'handrail' down the edge of a set of steps we plan to build against the side of the plant pot. Don't worry if your pieces do not fit smoothly together. Hopefully, you can plant your container to cover any large gaps in your design. As most plants used for miniature gardens are rock garden or alpine plants that hate wet feet in winter, you should make sure all levels of your garden have adequate drainage. Place 1/2 inch to 1 inch of broken pot shards or gravel (or both) on the base of your miniature garden, using larger shards of pot to cover the drainage hole without blocking it. This will help to prevent the soil from washing out of the bottom of the pot before the roots have developed to hold it. Don't use very fine particles or sand as your drainage medium. Larger pieces allow excess water to seep through and out of the pot more easily. If you don't have pot shards or gravel, you can use styrofoam packing peanuts or other inert materials in the base of the pot to allow water to drain through the base. The type of soil you use for your miniature garden will depend on the growth requirements of your plants. For this garden, we are using alpine plant varieties, or plants which need good drainage but some moisture and humidity around their roots. Most dwarf plants do not require very rich soils as they grow slowly. To mix a soil for alpine and rockery plants you can use roughly one part potting soil mix to one part clean builder's sand (playground sand, decorative sand, anything without salt or other additives). If you cannot easily obtain sand, you might be able to get by with a soil mix sold for potting African violets. These also require humid, but well-drained root conditions. Most soils sold for African violets contain an obvious amount of sand or alternatively small white lumps of pumice or "perlite" which create good drainage. Avoid soil mixes which are spongy or contain a lot of peat moss or coconut fiber. If you wish, you can add a tablespoon or two of a slow release fertilizer pellet into the soil mix. Alternatively, you can use a dilute solution of water-soluble fertilizer when you water your plants. With your soil mixed for your plants, set your dividers in place in your broken plant pot and begin to fill in the soil, packing the soil around the dividers to hold them in place, and making sure you leave space for the soil and rootball of the plants to fit into the pot. You can always add a bit more soil as you plant, but it is difficult to take soil away without tipping over your dividers at this stage of planting. In the photo on this step, we have the first divider in place and need to position the 'handrail' section and the steps as we go. To set plants into miniature container gardens you need to ensure the soil around the roots of the plant is well blended with the soil in the container. If the soils are not well blended, water will not pass from the container soil into the root zone of the plant and the plant may die. Remove the pot from the plant you wish to transplant, and loosen up the root ball of the plant, spreading the roots out and exposing some of them. If the root system is very matted you may have to gently tear it apart. It should recover! When you place the plant in the new container, mix a bit of the root ball soil with the container soil, spread out the roots, cover them with container soil, and press the soil firmly down all around the transplant to bind the soils together. It helps if the root ball soil and the container soil are both slightly damp. Some plants for miniature gardens are sold as group plantings. The example shown her is Rhodohypoxis which is sold as groups of flowering tuber-like roots in a single pot. For miniature gardens, these groups of plants can be carefully teased apart to give more natural groups suited to the scale of the miniature garden. You do not need to plant the entire clump in one place. Divide out suitable groups and treat each group as a transplant, mixing the soils, spreading out the roots, and tamping the plants firmly into position in your miniature garden. With the groundcover in place on the lower level, we have left space for a small line of R Rhodohypoxis as a flowering border. we will balance that border with a small group of the same plant at the base of the 'steps' in our miniature landscape. With the base plants in place, we can position the main feature tree in our garden, a dwarf pillar version of Port Orford Cedar called "Ellwoods Pillar". It grows very slowly, especially if its roots are restricted, and it can be pruned to reduce its growth further. Other possible trees in roughly the same size and scale can be created by pruning bush thyme into miniature trees or using Miniature Cyclamen Plant. To finish off this garden scene we have set a series of steps made from sections of the broken plant pot and the rim of the pot, so they run down the side of the pot to join the layers of the garden scene. The steps are built by starting with the bottom planting, and setting a step into the soil at the same level as the plants, then adding soil above that step to set the next step against and so on to the top of the pot. Just before we set the final step into place at the top of the scene, we planted a small leaved creeping version of Thymus praecox, to fall over the wall at the top of the garden, eventually covering the join of the 'handrail' and the upper garden wall. Once that plant is in place and tamped down, the final step can be set into the edge of the upper garden. When all the plants and dividers are in place in the new miniature garden, place a bit of mulch, or some shreds of moss or paper over any exposed soil at the top of the garden and water the entire thing gently. The paper or moss will help disperse the water and keep the top layer of soil moist while the plants become established. If you wish, you can water with a special transplant fertilizer designed to help root growth. These water-soluble fertilizers usually have a high second number (phosphorus percentage) compared to the first and third numbers (nitrogen and potassium) and more importantly, contain a bit of rooting hormone (Indole-3 butyric acid) to help roots develop fine hairs. Set your newly planted garden in a shady cool spot for a few days out of the sun while the plants adapt to their new home. Gradually bring the container out into the full sun (or conditions for your particular plants) once the plants are showing signs of new growth. With careful watering and a bit of judicious pruning, these miniature gardens can last for several years. Likely the plants will last longer than the already broken container. As the plants grow too large for the miniature garden setting, move them into new settings or individual pots.